Lena Nelson loves For-Mar Nature Preserve & Arboretum, and she goes there often with her aunt and three siblings. So when she heard about a grant offered by the National Parks Trust to fund field trips for school children, she knew she wanted to apply for a trip to For-Mar for her fifth grade class at Montague Elementary School in Mt. Morris who hadn’t been able to afford a class trip in many years. You’ve probably figured out that Lena is a student in that class, not the teacher! But that didn’t hold her back. Lena asked her aunt to help her arrange meetings with her school principal and For-Mar staff so she could discuss the cost of the trip, including bus transportation and lunch for everyone. 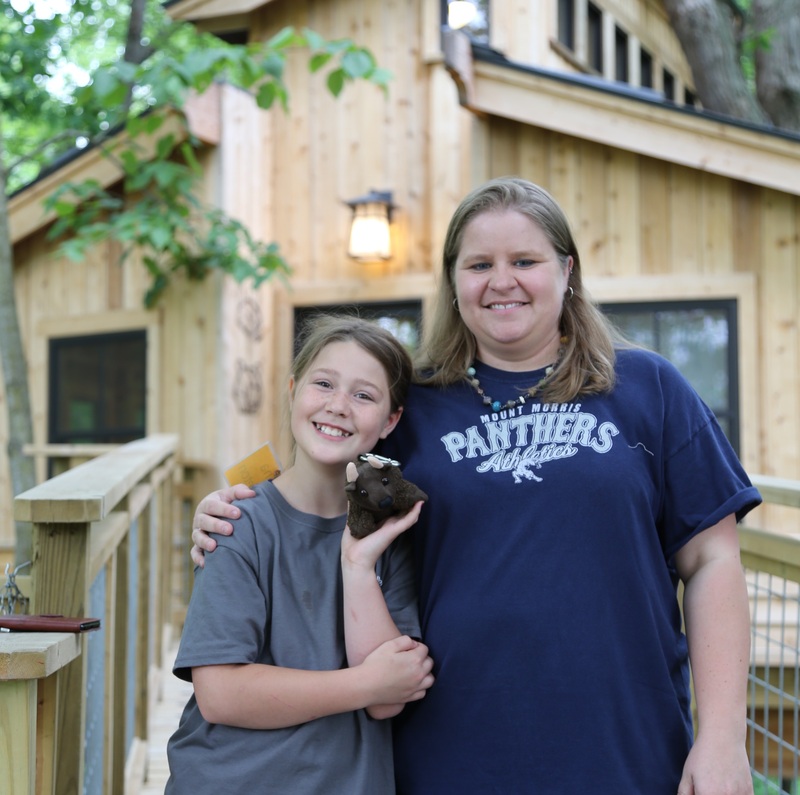 She also worked with our staff to design the trip so her fellow students could tour For-Mar’s new treehouse and help the nature center by picking up litter and removing invasive species. “The kids in my school don’t get the chance to go outside and learn about nature like I do,” Lena explained. She wants them to learn about taking care of the outdoors and helping animals. And if they have the opportunity to meet our superheroes, the Preservers, she wants the students to understand that each of them is a superhero for the earth, too. The National Parks Trust enthusiastically agrees with Lena, and they awarded the field trip as part of the Kids to Parks Day program. In fact, they were really delighted to receive a grant application written by a student. They don’t get many of those! In June this lucky class of fifth graders made their way to For-Mar, and we were as excited as the students! They had an invasive species pulling competition, treehouse tours and nature education as Lena showed everyone why she loves For-Mar so much. Meanwhile, Lena was selected to be a Buddy Bison Ambassador for the National Parks Trust. She has been asked to be a spokesperson for the Kids to Parks Day program by volunteering and writing stories for children’s newsletters to help spread the word about this important and meaningful opportunity. We’re very proud of Lena. She is one amazing girl who is doing great things for her classmates, her school, and her community. We look forward to seeing what she does next.